In 2008, Dafna Talmor and Lucy Levene set up a shared studio in East London. 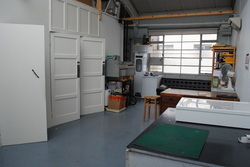 The double height, brightly lit studio situated within a secure gated location near London Fields contains colour and B&W darkroom facilities available for hire on a short or long-term basis. For more info please e-mail Dafna Talmor using the contact page or visit our website here.